Who knew? Ryan Scott, the "hottie" from Bravo's "Top Chef" and the new Executive Chef at Mission Beach Cafe, is a vegetable man. Had a fine meal the other night at Mission Beach Cafe with my awesome friend and SF Station colleague Dan Goldstein. 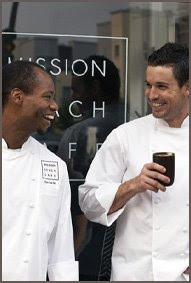 After leaving the now-defunct Myth Cafe and becoming a head-turning celeb cheftestant on "Top Chef," Ryan Scott (right) joined pastry chef Alan Carter (left) over at Mission Beach Cafe at 14th and Guerrero in summer 2008, to minimal twitterings and mentions in the press. Before Scott took over as executive chef, the small, cozy-chic cafe/restaurant was getting good reviews for ambience and attitude but mixed reviews for food, thus keeping it on the fringe of the SF foodie restaurant pantheon. Now that a celebrity is on the stoves and word is spreading, business is fairly booming. "I was traveling a lot, doing appearances and events from the 'Top Chef' thing, and I could have kept doing that for a while." But the opening at Mission Beach Cafe seemed like a solid idea, so he bit. "It's a big change, going from big kitchens like Myth [Cafe], Daniel, and Danko to a 40-seat operation like this," Scott emphasized. "We don't have a walk-in here, so I'm doing 3 meal periods using stand-up refrigeration. It's wild." "Weekend brunch is huge here; while we'll do 60 covers at dinner, we do 300 covers at brunch," said Scott. "I'd like to open a place that's all brunch, actually," he continued. "Just a counter, a few staff, and eggs all day!" The neighborhood is a change, as well. "I hadn't spent much time in the Mission, so that's a big change." The most notable difference? "The vegans and vegetarians! There are a *lot* more of them down here, so that's been interesting. I'm a vegetarian, so..."
"Yeah, I'm a vegetarian! All the starters [on the dinner menu] are vegetarian, and all of our soups are vegetarian." So *that's* why the vegetable-fueled starters we had were so ding dang delectable. This guy knows his way around a vegetable. And frankly, we need more of that. I'm not vegetarian, but I completely adore well-considered vegetable and fruit cookery. It is purely unacceptable to me that vegetarians often have little choice but to order a stupid polenta square with grilled zucchini, bellpeppers and pesto -- the type of cop-out dish that so often passes for a vegetarian entree in San Francisco restaurants. Virtuosity with a vegetable is a sure sign of culinary skill! At Mission Beach Cafe, where the intent is not to "break culinary boundaries" but to produce food that is "simple and clean," a dish of fried shishito peppers ($7), similar to pimientos de padron but a tad lighter in character, was *massive* when paired with confit cherry tomatoes and fleur de sel in a light dressing of...what? Tamarind? What was that lightly "A-1" taste that made the whole dish stand up and salute? Ah...apple cider vinegar and ginger. Nice. Two hunks of grilled bread on top: double nice. A masterful, decadent salad of black Mission figs, perfect nectarines, shaved fennel and triple cream brie-ish business (St. Andre maybe? $13.50) was made even more stunning by a lightly mustardy (?) dressing, crunchy little croutons and delicate fronds of fennel tops. Grrrr. It was devoured in less than 3 minutes. An heirloom tomato salad ($10.50) was far tastier than expected, its goat cheese, mustard croutons, heavily dressed greens and delicate lemon cucumber slices all sneaking up on one another and going "Boom!" on the tongue. Quadruple nice. Although we kept our ordering mellow with a side of perfectly roasted summer pole beans in a savory anchovy butter, we did eye a vegetarian entree of corn crepes with wilted escarole, gypsy peppers, brown butter, and pine nuts ($18). Noted Scott, "Next [time the menu changes] we're going to feature squash, scooped out and filled with a parmesan pudding..."
Holy jeez; to be honest, I lost track of what else he said, I was so instantly thrilled by the idea of parmesan pudding in a squash. I really do love a good vegetable. Alan Carter's desserts at MBC are delightful; a banana butterscotch cream pie was deadly good, and a strawberry mousse cake was a light and lovely take on strawberry shortcake. Fabulous. MBC is definitely worth a visit for those who like a little glory in their salad course, so check it out! It's obvious that Scott and his team are skilled at setting starters to shine. On the flipside, of course, knowing the chef's leanings, it is now the *tiniest* bit less of a mystery as to why our grilled duck breast and coriander-crusted yellowtail entrees were...er...just so-so.